Over time, the legs can bend and warp under the weight of your tank when it’s full of oil. You should always check this part of your tank after a heavy snowfall, as this additional weight can cause havoc to old oil tanks. You should also regularly check the legs are resting on firm footing, and that heavy rains or winds haven’t caused the ground below the tank to shift. Tanks can be susceptible to corrosion from below, and this means that over time they are more likely to leak. Check on the ground around your oil tank for any obvious oil spillages or a strong smell of fuel. You should also check around all the openings and pipes for signs of rust as over time these could weaken further and result on a major clean up from spilled oil. If you regularly keep an eye on your fuel consumption and notice any changes to how much fuel you seem to be using, this could be an indicator of a fault or a leak – so always check your tank for obvious damage or defects. If in any doubt, call in a professional to examine this in more detail for you. 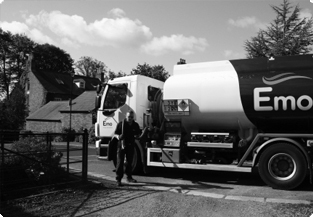 It’s important to protect the flow of oil to your boiler, and if your tank is outside and has exposed pipes which are at the mercy of the elements, this can have serious consequences for your oil tank. Make sure to properly lag any pipes and always check them when the weather is poor to make sure they are adequately protected. Do you think there’s water in your tank? One of the biggest oil tank problems in Ireland (thanks to our lovely weather) is that water can make its way into the tank if the openings are not closed properly, or if there are cracks in the tank allowing rainwater to seep through. Some symptoms of water in your tank include rust on the inside, freezing temperatures causing blockages in the fuel pipes, and a sludge build up on the inside of the tank. This needs to be corrected by a professional, as it concerns dangerous contaminated fuel – so don’t try to fix this yourself.